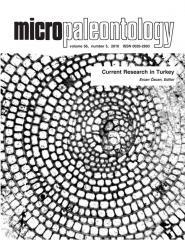 ABSTRACT: A recently discovered deposit of Late Cretaceous diatoms on Devon Island contains exceptionally well-preserved siliceous microfossils. Two diatom taxa from this deposit, previously identified as belonging to the genera Actinodictyon and Lepidodiscus,were examined with light and scanning electron microscopy. The present study revealed that these two taxa belong to the genus Lepidodiscus. Both were found to display an extremely complex structure of their radially and concentrically undulate valves, involving porous canals, hyaline areas and an external network of thick costae locally thickened to form tubercles. Different number of alternating depressed and elevated sectors located in themarginal zone of the valve, and different structures associated with the external openings of marginal rimoportulae were found to be a sufficient basis for erecting a new species, Lepidodiscus annamariae sp. nov. The excellent preservation of the Devon Island material also allowed for a documentation of the structure of the girdle, composed of multiple open bands.